Penny Hollow native Justin Kent is an architect stuck with one last project on his list of helping the town revitalization effort. He needs Summerfield, the creepy old house that MacKenzie Dillon just inherited from her great aunt. Mac has other ideas for the place now that she's trying to wrench her writing career from the gutter after her divorce. But there's something sinister lurking in the gorgeous old house and the history it holds ties Justin and Mac together in more ways than anyone could have fathomed, especially someone as skeptical as Justin. Oh, how I love a good romance with a southern gothic feel and plenty of exciting mystery. I truly wasn't expecting to get it in the category romance genre but HAUNT ME delivers nicely and in just the right length to fill an overcast afternoon. While predictable it's still a fun page turner with lots of sexual tension between Mac and Justin. I really found the pair to have great push and pull that moved forward at a good pace. They're not so wonderful on their own, I found Justin a bit unreal and Mac a bit too vitriolic at first only to wilt into damselishness later. 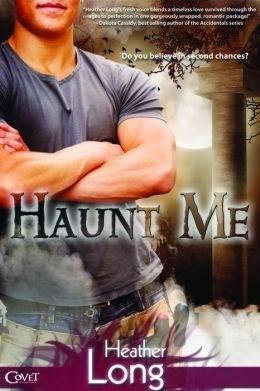 HAUNT ME is one I would much recommend for those who like a really moody and dark story. The town itself really had me excited, there's so much potential for this book to spread out into a series it's quite frustrating to have it wrap up. I really enjoyed Long's voice and will certainly keep an eye out for anything more she contributes to the genre.